“So they have to adapt but they have to remain objective, maintain a high quality newspaper and if you read something in the Straits Times or on CNA, you must know that it’s real.” – PM Lee in his National Day Rally speech in 2008. However, in the printed edition of the Straits Times the next day, 19 August, Mr Tharman’s “public interest” remark was inexplicably left out. The Straits Times published an ad verbatim transcript of the exchanges in Parliament betwen Mr Tharman and MPs. So, why was Mr Tharman’s “public interest” remark edited out of the transcript? 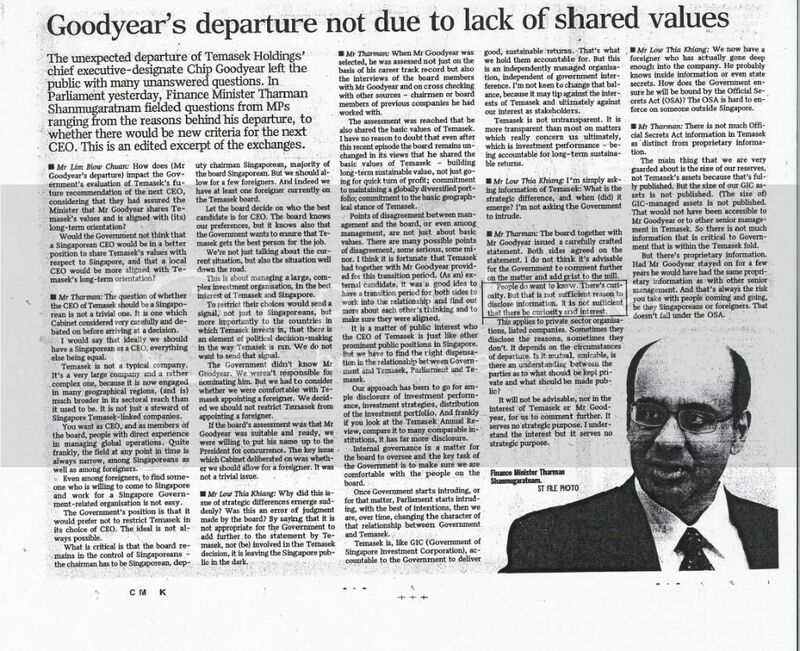 Did the Straits Times intentionally leave out Mr Tharman’s admission that the issue of Mr Goodyear’s resignation was of public interest?